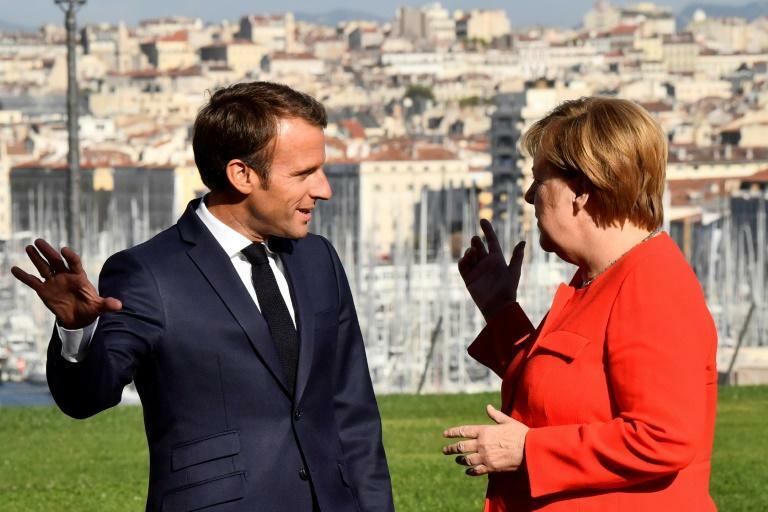 French President Emmanuel Macron and German Chancellor Angela Merkel sought to put aside their domestic woes on Friday and advance their European agenda at a meeting in Marseille. The two leaders both face difficulties at home, with Macron hit by cabinet resignations and falling polling numbers and Merkel again under pressure over her immigration policy. Both avoided questions from journalists as they met at the 19th century Pharo palace overlooking the French port, but the body language was characteristically warm between them. "Germany and France have the same approach to problems," Merkel told reporters. "We need to continue to work together for the sovereignty of Europe." Merkel and Macron have both backed deeper defence links between EU nations and believe that Europe must stand up for itself in the face of US President Donald Trump's aggressive nationalism. But they are at odds over the size of a proposed new budget for the eurozone, which would see more money transferred from wealthy members to poorer ones, and are both under fire from anti-immigration nationalists at home and abroad. The "Franco-German motor" at the heart of Europe does not appear on the cusp of driving through major changes despite Macron's ambitions, analysts told AFP this week. Ronja Kempin, a senior fellow on EU and France at the German Institute for International and Security Affairs, said she expected "no big comprehensive reforms of the kind envisioned by Macron" before European parliament elections in May 2019. Differences over immigration have also exposed deep fractures in Europe, with hardline Hungarian Prime Minister Viktor Orban and influential far-right Italian deputy premier Matteo Salvini openly targeting Macron as an opponent. Macron replied this week that he was happy to be considered their "main opponent" ahead of the European elections scheduled for next year in which he is hoping to put together a coalition of centrist, progressive parties. Macron said migration would be on the agenda for his talks with Merkel, as well as Britain's departure from the European Union next year. He said he wanted migration to be "a change and not a fear" and is eager to cement a new collective policy in the EU for dealing with migrant arrivals at an informal summit of EU leaders in Austria on September 20. Merkel is struggling to keep her coalition government together having been attacked by her conservative interior minister Horst Seehofer from the CSU party this week over immigration. Seehofer said he wished he could have joined recent anti-immigration marches in the eastern German city of Chemnitz that were marred by far-right violence and he called migration "the mother of all political problems in this country".